Despite the respect of most Americans for law and the determination of the legal system to protect the rights of individuals, the United States, like all other countries, does experience crime. But crime has been going down in the United States since the 90s. In New York, Fort Worth and other cities, police are cracking down on quality-of-life offenses like public drinking and aggressive panhandling and claiming credit for the big drops in violent crime that follow. Violent crime rates have been declining steadily since 1994, reaching the lowest level ever recorded in 2005. According to the Bureau of Justice Statistics National Crime Victimization Survey (NCVS), from 1993 through 2004, the violent crime rate fell 57 percent and the property crime rate declined by 50 percent. 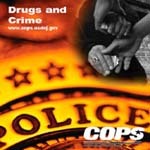 A high percentage of crime in the United States is directly related to the illegal sale and use of drugs. Drugs are smuggled into the country by organized groups of criminals despite intense efforts by the government to stop the illegal drug trade. Those who become addicted to drug use sometimes rob or break into houses or stores to get the money to pay for the drugs. Drug abuse has caused great concern in the United States. The federal government has worked hard to stop the growing of opium poppies, of coca plants and of cannabis (source of marijuana and hashish) in other nations. It has also set up special agencies, sometime working with agencies from other nations, to catch the smugglers outside and inside the United States. Teachers and many other citizens work together to teach children about the dangers of drug use. Many government agencies in the states and private citizen groups work to help drug addicts give up their drugs use and turn to useful lives. Concern about crime has also led to special government programs and special programs of private citizen groups to stop crime and to help prisoners lead useful lives after their prison sentences end. In one program, young people are brought into the prisons to talk with prisoners. The idea is that prisoners can do more than any other people to stop young people from turning to crime. The experience of being inside a prison also might have a crime-deterrent effect on the young people. In some programs, prisoners learn a useful trade so they won't return to crime when they are released. Government programs also encourage private businesses to give young people from poor families jobs so they will be able to earn money legally and will not feel that criminal activity is their only means of getting what they need. In the American judicial system, it is often the 12 citizens who make up a jury that decide a defendant’s fate. Learn how Americans carry out this important responsibility. Juries — usually groups of 6 or 12 ordinary citizens — provide a crucial service for their fellow citizens: Just as in medieval England, where they got started, juries prevent government, even democratic government, from pursuing oppressive prosecutions. Community-based Groups Combat Crime in American Cities By Burton Bollag. One recent Tuesday evening, 14-year-old Troy Robinson was in a city park when his cousin, who was standing next to him, was shot and killed. The next day, his dark-skinned young face hardened by what he had witnessed, Troy spoke with America.gov about growing up in one of this city's worst neighborhoods.